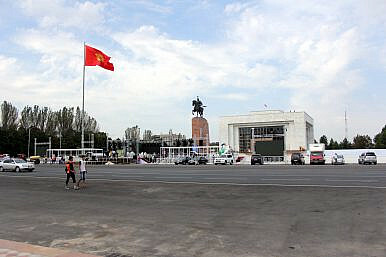 Preparations in Ala-Too Square in central Bishkek continued apace today. A car rammed the embassy’s gate and detonated a bomb inside the compound. Three Kyrgyz workers were injured. BISHKEK — Tuesday morning, around 9:30 am local time, a car rammed the east gate of the Chinese Embassy in Bishkek and then detonated an explosive device. The driver of the Mitsubishi Delica died in the blast, which decimated the embassy’s grounds and shattered windows in nearby buildings. Three Kyrgyz workers at the embassy were injured, with some reports indicating that two were 17-year-old gardeners and others that two of the injured Kyrgyz were security guards. While the Kyrgyz government, like those of its neighbors, often overemphasizes the threat of terrorism–routinely reporting on foiled plots–attacks like the bombing of the Chinese Embassy are exceedingly rare in the region. Throughout the rest of the day on August 30, central Bishkek appeared to be moving at its normal pace; perhaps a little more crazed due to road closures in the morning while rehearsals for tomorrow’s Independence Day parade had one of the city’s main thoroughfares closed down. Kyrgyz Deputy Prime Minister Jenish Razzakov said that the car rammed the embassy’s east gate and drove another 40 or 50 meters into the compound before detonating a bomb. Videos appeared rather quickly on social media showing a plume of smoke rising from the embassy compound. Those Googling the Chinese Embassy in Bishkek will mistakenly be directed to a location in the city center; the Chinese Embassy is located behind the American Embassy in Bishkek’s southern suburb, decidedly less dense than the city center area and more residential. Early reports mistakenly claimed the blast had happened at the U.S. Embassy. Kyrgyz authorities have not yet identified the bomber, nor has any organization claimed responsibility for the attack but the usual suspects are expected: Islamic terrorists, specifically Uyghur separatists, given the target of the Chinese Embassy. Chinese officials have been targeted in Kyrgyzstan before: two Chinese officials were shot in Bishkek in 2000 and a Chinese consul and his assistant were shot in Bishkek in 2002. Both shootings were attributed to Uyghur separatists, though some analysts questioned the verity of that claim. Over the last decade, the Chinese presence in Kyrgyzstan has only grown more prominent, at times sparking deep frustration on the part of Kyrgyz who criticize Chinese business practices and accuse Chinese companies of shoddy work. In addition, Chinese merchants have begun moving in and driving out Kyrgyz merchants from Bishkek’s bazaars. With this simmering anti-China mood in mind, and the upcoming state holiday, a Kyrgyz nationalist narrative could also have fed the attack. Without further details from the authorities, it’s simply a guessing game. What isn’t a guess is that the timing of this attack could not be worse. On August 31, Kyrgyzstan celebrates its 25th independence anniversary. Three days later, the World Nomad Games are expected to draw in thousands of tourists, a few D-list celebrities, and at least one other regional leader (Turkmenistan’s president). Then in mid-September, Bishkek will host the Commonwealth of Independent States’ jubilee summit. Security was already expected to be tight during tomorrow’s planned festivities and the embassy bombing will only increase the pressure on Kyrgyzstan’s security services. There are frequent reports that the Kyrgyz have thwarted this or that terrorist plot, though regional analysts often have doubted the completeness of Bishkek’s claims. On August 26 a Russian man, accused by the authorities of having a grenade, ammunition, and Islamic State propaganda in his apartment, was arrested in Bishkek. A former opposition politician, Nurlan Motuev, was sentenced on August 29 to seven year on charges that he publicly supported terrorism and incited ethnic, racial, and religious hatred. Social media accounts specializing in historical photos of Kyrgyzstan reflect young people’s desire to learn about their country’s past.